王润萍, 戴铃灵, 陈雅飞, 徐永健. 2019. WANG Run-Ping, DAI Ling-Ling, CHEN Ya-Fei, XU Yong-Jian. 2019. Oceanologia et Limnologia Sinica, 50(2): 378-387. WANG Run-Ping, DAI Ling-Ling, CHEN Ya-Fei, XU Yong-Jian. 2019. EFFECTS OF SHORT-TERM TEMPERATURE OR SALINITY STRESS ON FEEDING BEHAVIOR AND ANTIOXIDANT OF MARINE MEDAKA (ORYZIAS MELASTIGMA)[J]. Oceanologia et Limnologia Sinica, 50(2): 378-387. 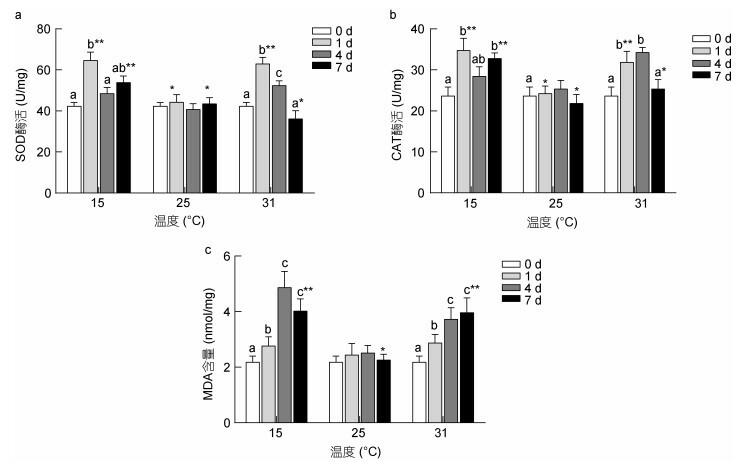 Abstract: The effects of variable temperature acute change (15℃, 25℃, 31℃) and salinity acute change (5, 15, 25, 35) on the feeding behavior and antioxidant of marine medaka (Oryzias melastigma) were investigated. 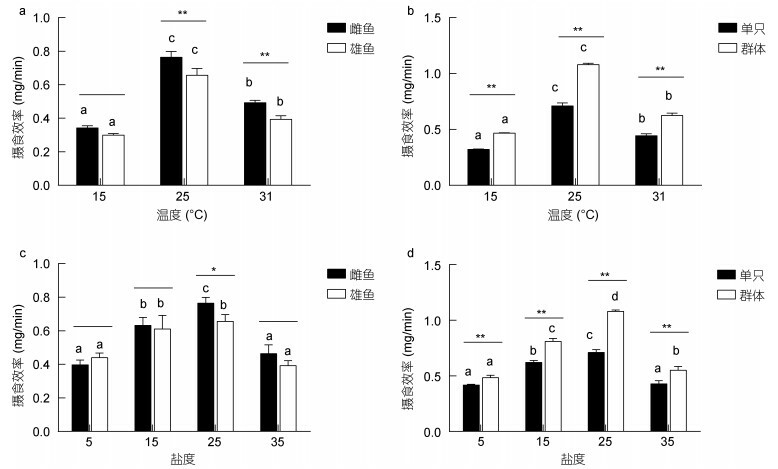 The results show that the feeding response time increased, while the feed intake, feeding efficiency, and feeding success rate decreased significantly (P < 0.05) at a temperature of 15℃ and 31℃. The SOD, CAT activities, and MDA content increased first and then decreased with the temperature increased from 15℃ to 30℃. The SOD activities increased significantly at 31℃ group on the 7th day (P < 0.05). 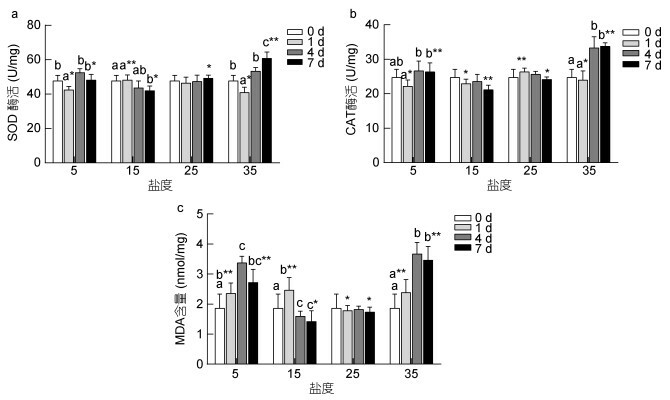 The MDA content significantly higher than the control group and increased significantly (P < 0.05) at the 7th day at the temperature of 15℃ and 31℃. Also, SOD, CAT activities, and MDA content decreased at first and then increased with increased salinity from 5 to 35, and the content of MDA was significantly higher (P < 0.05) than that of the control. 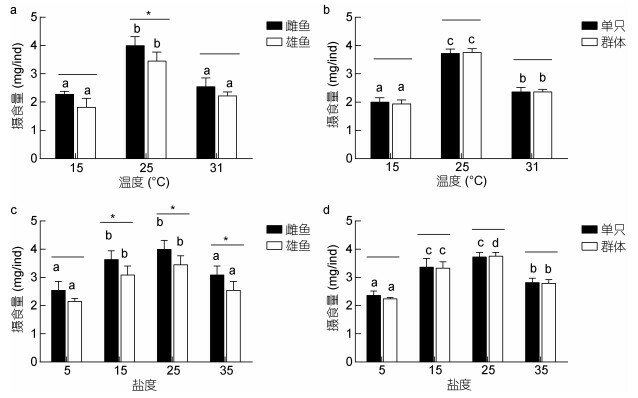 Therefore, we believe that a temperature or salinity acute change can affect significantly the feeding behavior and antioxidant system of O. melastigma, and the suitable temperature was 25℃, salinity was 15-25.